Our Menu Stands & Host Stands provide an all-inclusive two step direct marketing set for your restaurant or food service establishment. 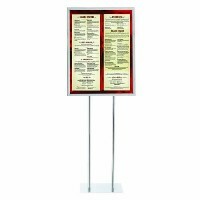 Menu Stands give passersby a preview of your food, and Host Stands offer an easy-to-see and welcoming reception station where customers can get a table. Buy a Menu Stand and Reception Stand today for your eatery to increase visibility and create an inviting environment for diners.